I've really enjoyed working with my CNC so far, though I'll confess, I've been doing mostly prototyping - and one giant commission of twenty four oval mirror frames - with no finished products in my catalog yet to show off. But a lot of the time I've been spending with the CNC has been setting it up just right. As mentioned in an earlier post, many of the next posts will be about the nuances of getting this thing set up, and with the first in the series, I'll talk about "torsion boxes". 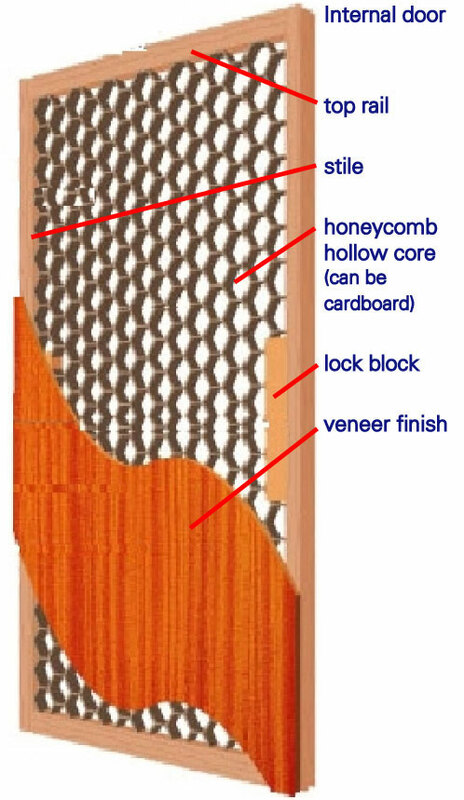 A torsion box is just a fancy word for a common construction technique where two thin layers of material are applied to either side of a lightweight core. The most common example that we interact with every day is a "hollow core" door, that is, probably the type of door inside your house. They're super flat, fairly light, and yet very strong. If you were to peel back the thin wooden skin on one side of that door, you'd see a grid of material perpendicular to that skin made of something light and cheap- thin wood, or perhaps even cardboard, depending on the door quality. But they're also used in ships, furniture, some bridges, and many other places as well. A few months ago, I bid on a kitchen cabinet project that included some 2" thick 15" deep shelves edge mounted on the wall. A 2" thick shelf, if made of solid wood of any variety, would be really heavy and expensive. For instance, a walnut shelf that large would be 0.7 pounds per inch of length, or 25 pounds for a 3 foot section. Mounting three of these on the wall with hidden hardware would be challenging to say the least. Solid wood also expands and contracts with moisture and temperature, making it more challenging to use for large solid wood furniture - see this blog for some more details about that. However, if made with 1/4" veneered MDF (medium density fiberboard) - a very smooth engineered product used as the core within a lot of furniture - the weight would be cut by more than half, to about 12 pounds for that same shelf. Now let's return to the world of the X-Carve CNC. I added some extension brackets that allow me to work with much thicker blocks of wood with the machine, up to about 4.5" thick. 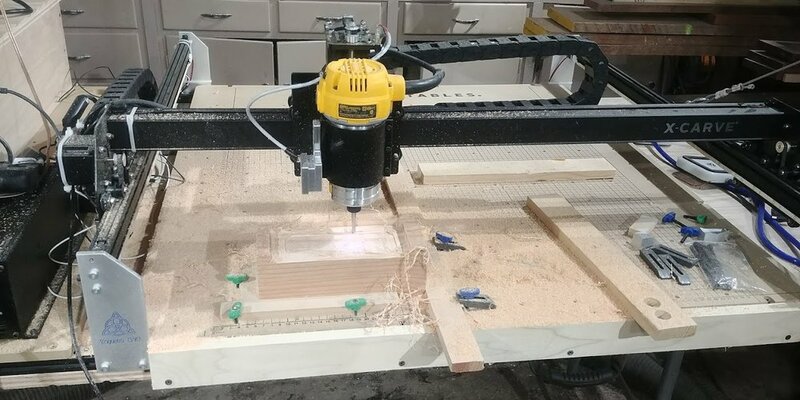 But the X-Carve z-axis only goes up & down about 3", so that means that for the more common thinner stuff that I'll be cutting and carving, such as a cribbage board or a customized cutting board, the cutting head wouldn't be able to reach the material. Here's where the torsion box comes in. By adding another 2" layer to the bottom - kind of like a high chair for my CNC - that negates the effect of those brackets, so that I can work with standard-height materials again. But it's critical that the surface be perfectly flat, so that it doesn't introduce any errors into the CNC. One other great bonus of this setup is that I can now easily use my vacuum clamps. 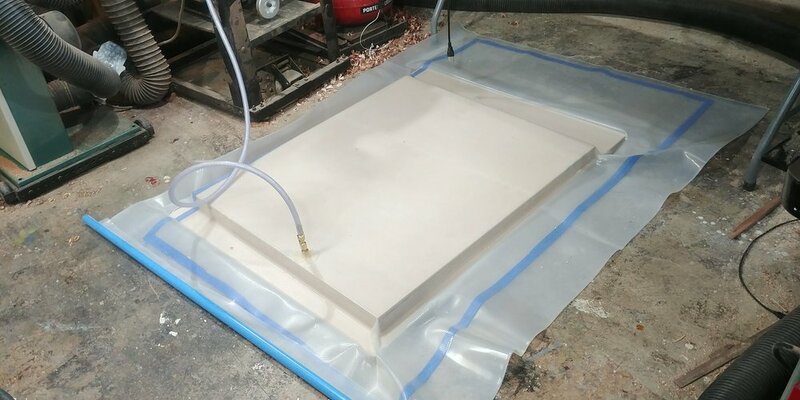 The vacuum pump I purchased is great for veneering, but with a vacuum, you can also easily clamp flat items - like that cribbage board, cutting board, or a sign - if the underlying surface is also flat. In fact, every square foot of clamping surface exposed to these vacuum clamps produces about 1300 pounds of clamping pressure. The vacuum clamps aren't a square foot - they're closer to 2.5" x 2.5", which produces only about 60 pounds of clamping force, but that's still huge - especially given that they do not mar the surface of what you're clamping, provide complete access to the top of the item, and are nearly instant to insert and remove, with the aid of a foot pedal. The X-Carve "waste board" - the gridded board you see in some of the pictures - is perfectly flat. But it also has about one hundred holes drilled into it, so that you can use screw clamps. You can see those in that picture above as the green and blue plastic inserts sticking out of the board. They're very useful in their own right, but they limit the use of the vacuum clamps since, unless they are very carefully placed, the vacuum just goes right out the other side of the board, through those holes. So there ya have it - now you know what a torsion box is, and you could even make your own door if you so desired! But if you'd rather have me make the doors - or anything else for your home or business - look me up! I'd be delighted to explore your project with you.